TGIF everyone! I have a roundup of some items on my radar – some are new, others are just simply new to me. Several of you have kept asking for a foundation roundup – I hope to have it go up next week as I just finished testing a few more formulas. I ordered a few shades of MAC foundation even though my skin can’t handle it to swatch for you as a reference point so stay tuned! Laura Mercier launched new additions to her Candleglow Collection with the Candleglow Concealer and Highlighter (1) and Candleglow Sheer Perfecting Powder (2). Both look promising and I will be testing them out next week. I have yet to see the colors in person but I am hoping I will have a good match. Will keep you posted! Le Metier de Beaute just launched a new Breast Cancer Kaleidoscope 2016 Edition (3) for the eyes. I have high hopes for this one as well as I just ordered sight unseen. I will review it as soon as I receive it. It’s been a while since I’ve shopped at Coach for myself but I stopped by the store to pick up a little anniversary present for my husband (this wallet). We decided on no presents this year but I still wanted to pick him up something small and practical. The Coach 1941 Collection Clutches (4) immediately caught my eye with the simple classic sleek look and soft leather. I’m the biggest sucker for flat pouches and these are calling my name. I haven’t bought one yet as some of the crossbody bags look like a great no-fuss option for weekends. If you’re a Coach fan let me know if you’ve had experiences with either! Tom Ford Beauty launches are always exciting. There’s a new Waterproof Foundation and Concealer (5), Shimmer Shots (6) and Fiber Brow Gel (7). I just started testing and will have reviews soon but I will say now the Shimmer Shots are pure love. Shopbop is having a mega sale that ends tonight (October 14th, 11:59 PM PST). Use code MAINEVENT16 at checkout for 25% off orders up to $500 and 30% off orders over $500. I need a pair of leather camel ankle boots and the ones from Madewell (8) look perfect. I’m still trying to pick out a pair. If you have any favorite camel/tan colored ankle booties or styles to recommend let me know. A couple weeks ago I went to a Shu Uemura Art of Hair Event where they showed us a few new launches. The Urban Moisture Collection is new and designed specifically for dry hair. I was able to test in the salon and it wasn’t heavy at all. 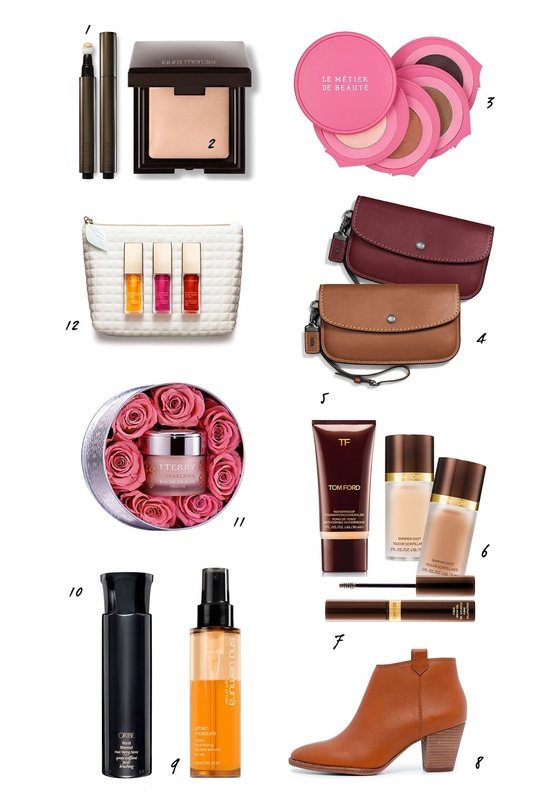 My favorite item is the Urban Moisture Hydro Nourishing Double Serum (9) which is a bi-phase spray. It helps add moisture to ends and prepare for heat styling. The stylist also used it in conjunction with the Wonder Worker and Ample Angora (both of which I love). My hair was surprisingly volumized, hydrated and soft all at the same time. There were no tangles and when it was being styled no tugging happened when the stylist worked the round brush through my hair (which rarely happens in salons for me). In my last hair care styling roundup a number of you recommended the Oribe Signature Royal Blowout Heat Styling Spray (10) so even though I have blow out products to last me months I bought it to try it. It is indeed amazing. Also new from Oribe is the Cote d’Azure Replenishing Body Wash (not shown) which is one of the most comforting and hydrating body washes I have ever tried. I still need to do more testing but it’s really really good. I’m really not happy about the price though. By Terry has some gorgeous items for holiday that has my wallet crying a flood of tears. The Impearlious Baume De Rose Deluxe (11) comes with roses! The holiday season is the season of sets. There are going to be a lot of tempting options whether you’re gifting yourself or others. Three on my radar include the Clarins Instant Light Lip Comfort Oil Trio (12), La Mer Discovery Collection Radiance Set and also the L’Occitane 2016 Advent Calendar (which sold out last year really fast).